Safety - J.J. White Inc.
We value the health of our stakeholders and always place it as a top priority. Since 1993, JJ White Incorporated has maintained a full-time Corporate Safety and Risk Management Department acting in a loss prevention and loss control coordinating capacity. The department works on a direct and daily basis with field labor and insurance carriers as needed. What Defines A Dropped Object? 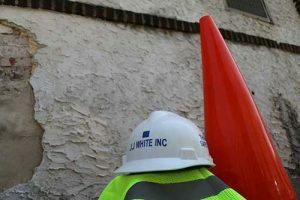 Even more commendable than cost and schedule performance is J.J. White’s betterment of project safety goals which resulted in the safe completion of the difficult and potentially dangerous work required. It is our opinion that this achievement is at least partially attributable to JJ White’s expansion of it's corporate safety program, which through the implementation of twice weekly Tool Box Meetings, daily Job Safety Analysis, management oversight, and a safety incentive program served to communicate to employees the singular importance of safety and JJ White’s commitment to compliance.